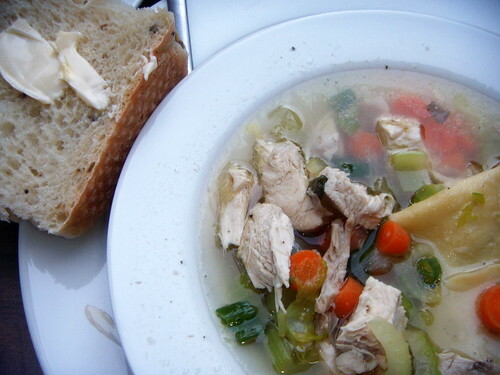 hearty classic chicken soup with fresh egg noodles, originally uploaded by aarn! +31st July, 2008+. took an entire chicken and brazed it skin down in some oil seasoned with some diced large bulb spring onions, garlic, bay leaf, a couple cloves, salt and pepper, then filled the pot with boiling water, and let simmer for an hour or so. made some fresh egg noodles with 2c. of flour, 5 egg yolks, and 1/4c. water, rolled it out with the pasta machine and used a 2.5in diameter round cookie cutter to make some nice large pasta. after the broth had reduced enough, the chicken was pulled from the pot and the meat was separated from the bones and fat, half of the chicken meat was added back to the soup, and the other half was put aside. lastly, added green onion tails chopped up, carrots, celery, celery greens, and the raw pasta shapes, and cooked until the pasta was tender, then served. since the vegetables were only cooked for as long as the pasta, they remained very fresh, which was key, there's nothing worse than soggy veggies (unless that's what you are going for). served with a whole wheat olive roll and a pad of butter. after dinner, the soup was separated into a quart of fatty stock (frozen for something later this week, maybe), a quart of frozen soup, and the other half of the chicken meat was made into chicken salad for lunches for the week.